In the face of climate change, land and water scarcity, declining growth in crop yields, and dwindling public budgets, donors will need to be more innovative in how they deliver aid for agriculture. The world’s population is expected to grow by 3 billion people in the coming four decades, and 1 billion are already food insecure. Feeding them all will require every tool available. One such tool is pull mechanisms, which can help overcome the underinvestment in agriculture in developing countries by increasing the demand and compensation for new technologies. Australia, Canada, the United Kingdom, the United States, and the Bill and Melinda Gates Foundation have committed $100 million for AgResults, an initiative that will use pull mechanisms to engage the private sector and encourage the development and dissemination of agricultural technologies aimed at improving food security and smallholder productivity. It’s a start. The first pilots under AgResults are conservative measures. Donor’s should be more ambitious in the future. With pull mechanisms, donors are looking for partners willing to take on some risk; they need to be willing to risk failure as well, as long as they learn from it. The world’s population is expected to grow by 3 billion people over the next four decades. Feeding them—and ensuring food security for the 1 billion who are already hungry or malnourished—will require every tool available, including reforming trade-distorting policies that reduce incentives to invest in developing-country agriculture and reducing biofuel subsidies that pit food against fuel. But that’s just the beginning of what developed countries should do to create a sound global environment for food security. In the face of climate change, land and water scarcity, and declining growth in crop yields, increasing investment in innovation and technological progress are also essential. With public budgets constrained and agricultural R&D in developing countries virtually nonexistent, donors need to be more innovative in how they deliver aid for agriculture. Australia, Canada, the United Kingdom, the United States, and the Bill and Melinda Gates Foundation took up the challenge at the June 2012 G-20 summit in Los Cabos, Mexico. They committed $100 million for an initiative called AgResults that will use “pull mechanisms” to engage the private sector and encourage the development and dissemination of agricultural technologies aimed at improving food security and smallholder productivity. AgResults will use prizes, patent buyouts, or advance market commitments—forms of results-based aid—that pay out only upon delivery and adoption of an innovation or product that meets criteria set out in advance. Innovation is a classic public good, and market forces alone usually fail to induce a socially optimal level of innovative activity. In response, governments can either use push mechanisms to expand the supply of innovation or opt for pull mechanisms to create demand. For some types of innovation, including basic science and early research without obvious commercial applications, governments often fund research upfront. Where potentially lucrative market applications exist, inventors can recoup research and development costs using patent and copyright laws that provide a temporary monopoly. It was public investment in agricultural R&D for developing countries that led to the green revolution in Asia and Latin America in the 1960s and 1970s. Thus, Africa is in special need of an innovative funding mechanism focused on invention, adaptation, and adoption. Pull mechanisms have strengths in three key areas relative to other tools for inducing agricultural innovation and adoption. First, they engage the private sector in research in developing countries where traditional IPRs are either weak or not valuable enough to generate interest. Second, they alleviate the information asymmetries that commonly arise between donors and researchers, and potentially between researchers and consumers, by making payments for technologies only when they are delivered. Finally, pull mechanisms fit well with donors’ efforts to move toward incentive-based approaches to make aid more effective. Imperfect information about researchers also makes it difficult to ensure that researchers’ incentives are aligned with those of the funders. For example, up-front funding may lead researchers, especially if they are employed in the public sector and do not anticipate private gains from an innovation, to undervalue features that are important to the final consumer. By putting the onus on innovators to ensure that the final product meets the needs of consumers—by linking payments to the level of demand—donors can partially address the asymmetric information between researchers and consumers and increase the prospects for broad adoption of new technologies. Pull mechanisms are only one of a number of incentive-based programs with which donors are experimenting that pay ex post for outputs or outcomes rather than ex ante for inputs. Mechanisms in the same broad family include pay-for-performance for those implementing projects; cash-on-delivery aid for governments that meet mutually agreed-upon targets, for example in educating children; and the Millennium Challenge Corporation’s model that rewards countries with long-term aid compacts when they meet certain thresholds for good governance. What distinguishes pull mechanisms from these other results-based approaches is that pull mechanisms have relatively focused objectives, involving innovation and technology adoption, and they generally aim to engage the private sector. The optimal situation for using a pull mechanism is when potential private partners are willing and able to accept some risk and when a temporary subsidy is sufficient to overcome the market failures impeding technological progress. In some cases, the main impediment to broad adoption of an existing technology is imperfect information on the part of consumers that prevents socially optimal levels of uptake. For example, the health benefits of Vitamin A–fortified maize (one of the AgResults pilots) are not readily linked to consumption of the product. Consumers may not purchase it if it is more expensive, or if it looks different from the less colorful variety to which they are accustomed. In such cases, a pull mechanism could still be useful in pulling innovation, but complementary public interventions, such as subsidized vouchers or public education campaigns, might be needed to support adoption until consumers learn to value the benefits. 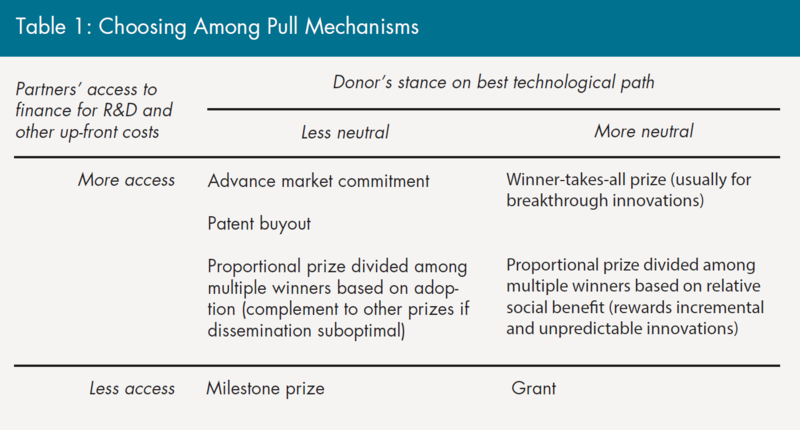 While all incentive-based approaches to aid might be considered pull mechanisms in some broad sense, the narrower definition here focuses on prizes, patent buyouts, and advance market commitments. Traditional prizes to spur breakthrough inventions are familiar, but there are also variants designed to encourage incremental innovation or participation by small firms. Patent buyouts and advance market commitments are flexible tools that can be designed to encourage the commercialization and dissemination of close-to-market technologies or the research and development for earlier-stage innovations. Like traditional prizes, proportional prizes are technology-neutral, but they are designed to reward incremental progress and to explicitly link prize payments to adoption. They are well suited for agriculture, where improvements in productivity are often incremental and where it can be difficult to predict which technologies will be successful. In one such proposal for African agriculture, prizes would be rewarded in proportion to their measured (and verified) social benefit, including a measure of adoption. By revealing what works in a given environment, the proportional prize could attract private investment (or donor funds) to scale up and disseminate the winning practices or products. A patent buyout can be used either to promote or disseminate innovation. In some cases, donors might decide that buying up an existing patent is the most cost-effective way to make a useful technology more widely available to poorer consumers. Alternatively, a patent buyout might be designed to resemble a prize for new innovation if donors commit in advance to pay an innovator for developing a technology that addresses a specified problem. In contrast to a traditional prize, where it is usually left to the market to develop and market the product, a patent buyout is designed to promote broad dissemination by putting the knowledge into the public domain. Still, delivery and adoption will be a problem if there are too few potential producers, large economies of scale, or other market failures that impede commercialization at an affordable price. The appropriate pull mechanism in a given situation will depend on a number of factors, but there are two general criteria, shown in table 1. The first is the amount of information the donor has about potential technological solutions to a problem and the degree to which the donor is able to specify desirable attributes of the technology. The second is access to finance and the ability of potential competitors to take on risk. To summarize the key differences, winner-take-all prizes are useful when funders are neutral regarding the preferred technological path to achieve a goal. They are most often used to help pull out a breakthrough technology. Proportional prizes can also be used when donors are uncertain about the most appropriate technology for a given problem, but they are more appropriate where progress is likely to be incremental or when adoption of an existing technology is the main goal. Milestone prizes require more specificity regarding attributes of the desired technology and will be more useful when seeking to engage smaller firms or when access to finance is a problem in the R&D phase. Advance market commitments are useful when donors have an idea of the type of technology they want, but do not have the information to specify the best path for developing it, do not want to pick a winner ex ante, and do not want to pay unless the technology is adopted. Before adopting any of these approaches, however, donors need to analyze the problem they are trying to solve. Numerous recent studies underscore the wide range of social, behavioral, or broader market failures that impede sustainable adoption of agricultural technologies in developing countries. Farmers will not invest in productivity-improving technologies if they cannot make a profit because there are no roads to get their crops to market or if they do not have access to saving or borrowing mechanisms. Consumers will not pay extra for micronutrient-fortified crops if the benefits are intangible. In those cases, donors may need to consider complementary policies, such as cash-on-delivery aid to improve market connections for farmers or vouchers to subsidize consumption of fortified varieties. There is not a great deal of innovation being pulled in these initial pilots. Two of them, for nutrient-fortified maize and aflatoxin control, target the broader dissemination and uptake of specific technologies that already exist. Moreover, since the benefits to consumers from using the technologies are not immediately obvious, sustaining adoption in the absence of ongoing public subsidies could be a challenge. The storage-technology pilot is more technology-neutral, but it is designed to do no more than provide incentives for adaptation or tweaks to expand the uses of existing products. Proposed pilots that did not make the cut, which would have been higher risk and taken longer to come to fruition, included those to develop improved fertilizers, livestock vaccines, or rice varieties. But the benefits also might have been larger. Development of a more effective and energy-efficient fertilizer is on the short list for the next round of pilots, and that could be a big step up in ambition. What is perhaps most notable about the initiative is that the donors are committed to incorporating well-designed monitoring and evaluation from the outset. If nothing else, donors hope to gain knowledge about what works under what conditions—and that is essential to innovation in aid delivery. Donors are being conservative in this first round of pilots under AgResults, perhaps understandably so, but they should be more ambitious in the future. Encouraging the adoption of existing technologies in the short run is helpful. But adapting to climate change, for example, also requires new innovation to develop more stress-resistant crop varieties, efficient irrigation technologies, and much more. Donors should also be more ambitious in encouraging investment by the private sector, including by engaging multinational companies with deep pockets and extensive experience developing improved seeds and other inputs. A true test of the AgResults approach would give more latitude to markets to determine the best technological solution to a designated problem. With pull mechanisms, donors are looking for partners willing to take on some risk, and they need to be willing to risk failure as well, as long as they learn from it. This brief draws on the analysis in Kimberly Ann Elliott, “Pulling Agricultural Innovation and the Market Together,” CGD Working Paper 215 (Washington: Center for Global Development, 2010) and “Ag Aid and Tech Breakthroughs: Pull Funding for Smallholder Productivity,” CGD Policy Paper 005 (Washington: Center for Global Development, 2012). The Center for Global Development is grateful for contributions from the UK Department for International Development and the Canadian International Development Agency in support of this work. http://go.worldbank.org/8XZD3IX8Y0, accessed February 25, 2013. Philip G. Pardey and Julian M. Alston, U.S. Agricultural Research in a Global Food Security Setting (Washington: Center for Strategic and International Studies, 2010), 6, 9. Nienke Beintema et al., ASTI Global Assessment of Agricultural R&D Spending: Developing Countries Accelerate Investment (Washington: International Food Policy Research Institute, 2012), 12. Nienke Beintema and Gert-Jan Stads, “Agricultural R&D Capacity and Investments in the Asia-Pacific Region,” IFPRI Research Brief No. 11 (Washington: International Food Policy Research Institute, 2008). See Kimberly Anne Elliott, “Pulling Agricultural Innovation and the Market Together,” CGD Working Paper 215 (Washington: Center for Global Development, 2010), 4–5. Michael Kremer and Alix Peterson Zwane, “Encouraging Private Sector Research for Tropical Agriculture,” World Development 33(1): 92–93). William Savedoff, “Incentive Proliferation? Making Sense of a New Wave of Development Programs,” CGD Essay (Washington: Center for Global Development, 2011), 1.
www.xprize.org/prize-development, accessed March 13, 2012.
www.xprize.org/x-prizes/incentivized-competition-heritage, accessed February 27, 2013.
http://healthresearchpolicy.org/blog/2011/sep/9/BVGH-fever-diagnostic-prize, blog posted September 9, 2011 (both accessed April 10, 2012). The arguments for the proportional prize in general, and applicability to Africa, are discussed in William A. Masters and Benoit Delbecq, “Accelerating Innovation with Prize Rewards: History and Typology of Technology Prizes and a New Contest Design for Innovation in African Agriculture,” IFPRI Discussion Paper 835 (Washington: International Food Policy Research Institute, 2008). www.gavialliance.org/funding/pneumococcal-amc/, accessed February 27, 2013.
http://transition.usaid.gov/press/releases/2010/pr100608.html, accessed May 23, 2012. The details of the proposals are still not publicly available but brief descriptions are in Australian Agency for International Development, “AgResults” (n. 14). For additional information, see the AgResults webpage (World Bank, “AgResults,” http://bit.ly/Zuy3OB , accessed March 13, 2013.